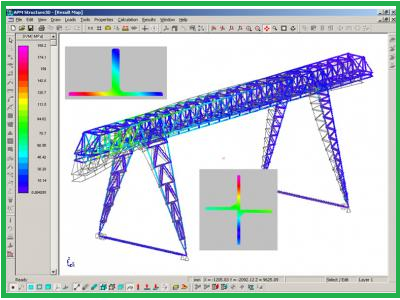 APM Structure3D is intended for complex analysis of 3D structures. It can be used for calculations of rods, thin plate-like and volumetric solid-state structures, as well as their arbitrary combinations. Therefore, there is a possibility of calculation of various building and mechanical engineering structures and their components. The complex analysis is comprehended as stress-strain analysis of the above–mentioned objects of arbitrary geometry with arbitrary loading conditions and constraints, as well as a number of other calculations. APM Structure3D has built-in pre-processor for model preparation. 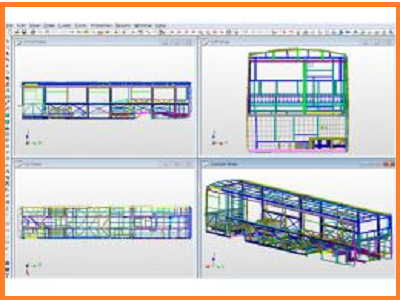 Structures and their components can be either created in graphical editor or imported using the DXF file format from 2D and 3D graphics editors or directly via APM Studio with prepared finite element mesh, loading conditions and constraints. Results are presented in convenient way and can be viewed using post-processing tools included. APM Structure3D uses stable and reliable numerical methods for treating large-scale dense matrices, providing low disk space usage and fast calculation. 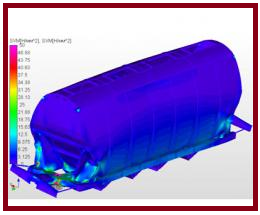 All calculations are performed using finite-element method. 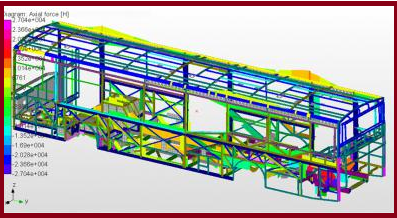 Application includes large library with rod, beam, cable, shell and solid elements. Other methods of structural mechanics appropriate to the above-mentioned problems are also used. Finite element number for rod sections meshing and, hence, the duration of calculation is user-specified parameter. By default the program provides typical settings for the majority of design cases. Total number of finite elements is limited only by capabilities of the user’s hardware. Model meshing is performed in semi-automatic mode and corrections can be made by manual editing. Several types of element validity checking are available. post-processor tools for calculation results processing. temperature effects on any component of the structure. Possibility of operation with different load cases to the structure and their combinations has been realized. APM Structure3D includes standard rolled section library and material databases. The specialized section editor provides possibility to create arbitrary non-standard sections including multiply connected ones as well as to edit the existing ones. After that all section properties are calculated automatically, including torsion moment of inertia. Import of section from an external graphics editor, which has a possibility of creating files in DXF file format is also available. 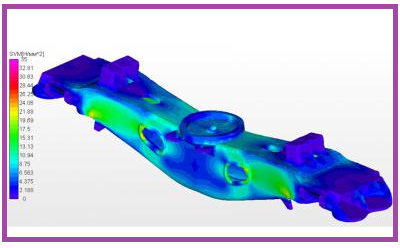 APM Structure3D can perform calculation of stress and strain values in any point of the structure, taking into consideration the external loading and weight of every component. Calculation of rod elements is carried out accounting all stress concentrations, which leads to more exact values of effective stresses. Besides, there is a possibility of setting an eccentric connection of rods in the structure, as well as automatic determining of weight of the whole structure. 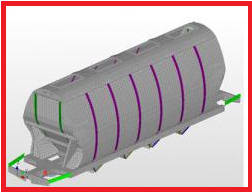 APM Structure 3D allows to determine internal loads within every finite element. This information can be used for further calculation of welded, threaded joints or riveted joints. Results of calculations by means of specialized visual tools are presented in color, in the form of contour lines, or in the form of diagrams of stress, moment, load-bearings, strains etc. Post-processing tools are simple, understandable, easy to operate, and what is essential that it facilitates the analysis of the results obtained. Post-processing tools allows printing and saving in RTF file format all results obtained, which makes report composition more convenient. 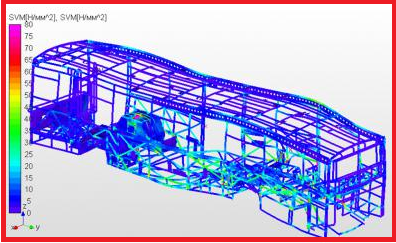 For convenience, in pre-processing stage structure can be represented as wireframe, thin plate or solid model (with consideration of cross-section types and positions). When operating with the module it is possible to use layers and to perform calculations on parts of the structure. APM Structure3D has detailed and easy-to-use help and documentation system. A wide spectrum of the above-mentioned possibilities, provided by APM Structure3D permits to improve significantly the design quality of lengthy objects and to reduce the design period, as well as to decrease considerably weight of the structure and, hence, to cut it’s cost. By means of APM Structure3D it is possible to design structures, close to full-strength ones according to strength, rigidity and vibration activity criteria and, therefore, meeting the customer’s requirements best. The forced oscillations mode is set as a law of changing load with time using the built-in specialized editor. Calculation of forced oscillations permits to obtain stress and strain maps in real-time operation mode. Review of the stress maps is carried out in the animation mode. 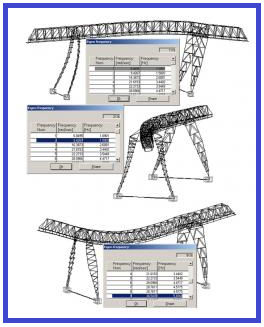 The mode of spatial truss structures calculation has been realized. In this case the framed structure can be transformed into the truss one and vice-versa. Based on the results of the calculation, APM Structure3D can be used to select necessary sections from the selected library, which satisfy strength and stability conditions for a given structure.